Chances are you use Lapua brass and if you’re like most serious shooters you can’t resist it when it’s on sale. 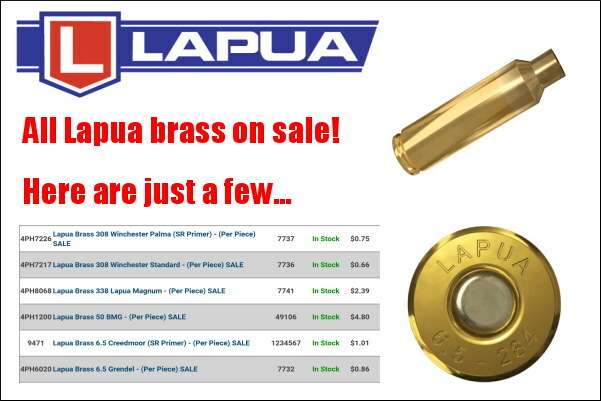 Here’s your chance to pick up nearly every variety of Lapua Brass at some of the best prices we’ve seen. Bruno’s is known for only shipping one consistent lot of brass whenever possible if you order multiple boxes. So don’t hesitate to lay in a good supply now. NOTE: You’ll find the most popular brass types, including 220 Russian, .223 Rem, .243 Win, 6mm Creedmoor, 6.5 Creedmoor, 6.5×47 Lapua, .260 Rem, 6.5-284, .308 Win (sm and lrg primer), .30-06, 50 BMG and more. However 6mmBR is currently offered by Bruno’s only as custom neck-turned brass. Looking for a great spotting scope to score targets and observe mirage and wind conditions? These Kowa 82SV combos sold out earlier this year but they’re back in limited supplies at Creedmoor Sports for just $849.95. Not only that they come with the desirable 25X LER eyepiece that is ideal for watching mirage — a key task for long range competitors. With this LER eyepiece you can quickly move from riflescope to spotter (and back again). 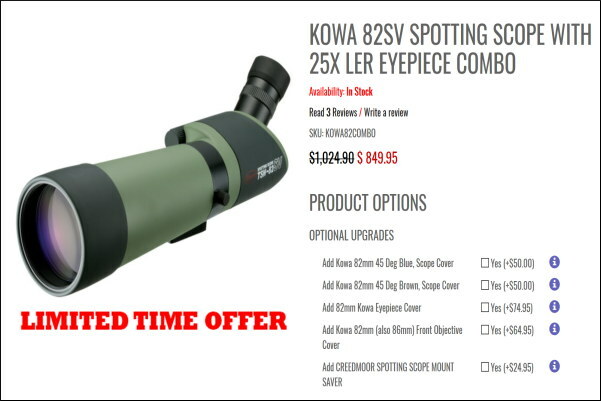 Kowa is a a highly-respect optics maker, and this is a very good value for a quality spotting scope that should last a lifetime. Still laying on the ground or using your wife’s yoga mat for shooting? For $21.25 now you can grab this NcStar Vism shooting mat and give your knees, belly, and elbows a break from the ground below. It opens wide and even has straps for pre-loading your bipod. This is a quality pad that helps put some space between you and your rocky position. When you’re done simply fold in the edges, roll it up and it takes up the same or less space as a sleeping bag. This is a good product tested and used by our staff. We’re in the holiday season with many super stocking stuffers to choose from. Here’s a great knife design from one of the premier knife-makers in the country. 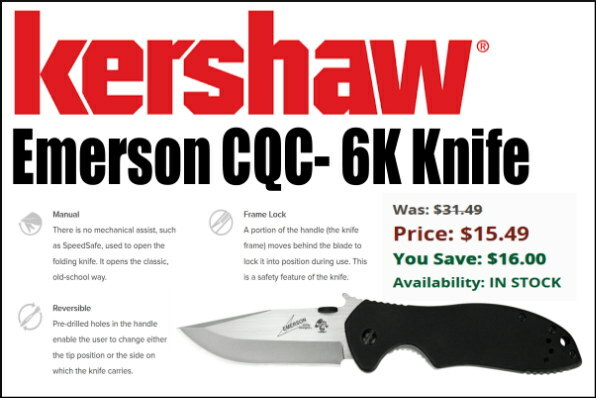 This Kershaw CQC-6C is on sale for just $15.49. This Kershaw is versatile, easy to open, and converts for left- or right-handed use. Who wouldn’t love to find one of these in a stocking on Christmas morning? If you’re like most shooters, you can use more light and magnification when inspecting brass and small gun parts. Here is the perfect tool to help and it doesn’t take up a ton of space. With the Bullet Central Magnifying Light you can ease your eyes and see into the primer pockets, flash holes or case-necks without straining. With your choice of battery-powered or rechargeable models, why not buy two and give one to your favorite range buddy? SK makes excellent rimfire ammo, and this Holiday Special makes SK even more attractive. Now you can get $5 cash back per 500-rd brick, up to $100. 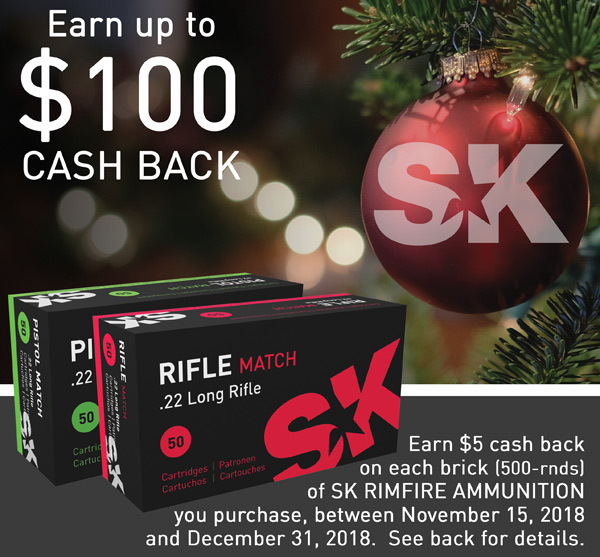 The offer is valid on qualifying SK rimfire ammunition brick purchases from November 15 to December 31, 2018. Download the rebate form at www.Capstonepg.com/skrebate. To get your rebate, mail in the sales receipt PLUS the UPC/Lot codes from your SK ammo boxes no later than January 31, 2019. 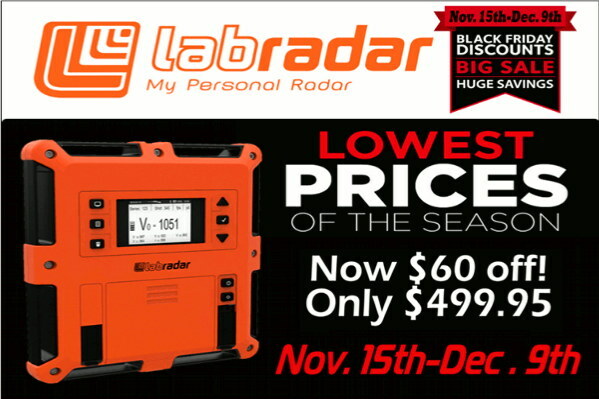 This deal is good for purchases through the end of the year. Additional conditions apply — see Capstone website for details. Credit Forum Member F-Class John for most of this week’s deals. 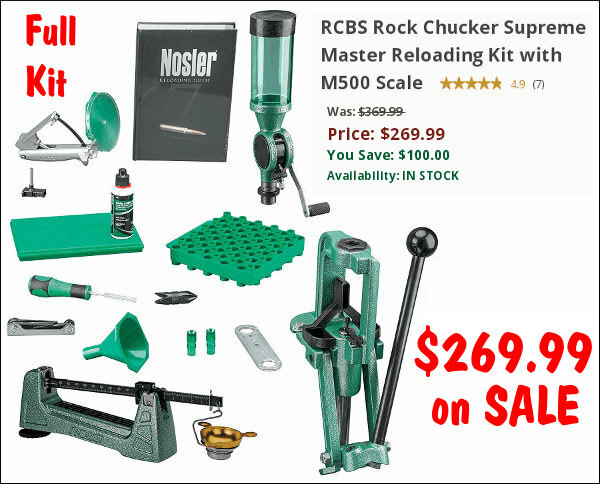 Share the post "Bargain Finder 165: AccurateShooter’s Deals of the Week"
I am going to hit on some key points when it comes to bullet pointing. How much pointing and trimming needed is going to depend on the bullet itself. Specifically how bad the bullets are to begin with. Starting out with better-quality projectiles such as Bergers is going to mean two things. First that you don’t need to do as much correction to the meplat, but also that the improvement is going to be less. NOTE: We recommend you DO NOT POINT hunting bullets. Pointing can affect terminal performance in a bad way. What is important here is that you never want to over-point. It is far better to be safe, and under-point, rather than over-point and crush the tips even the slightest bit. To quote Bryan Litz exactly: “Best practice is to leave a tiny air gap in the tip so you’re sure not to compress the metal together which will result in crushing. Most of the gain in pointing is taking the bullet tip down to this point. Going a little further doesn’t show on target”. So in essence you are only bringing the tip down a small amount… and you want to make sure you leave an air gap at the tip. Also keep in mind, bullet pointing is one of those procedures with variable returns. If you only shoot at 100-200 yards, bullet pointing will likely not benefit you. To see the benefits, which can run from 2 to 10% (possibly more with poorly designed bullets), you need be shooting at long range. Bryan says: “Typically, with pointing, you’ll see 3-4% increase in BC on average. If the nose is long and pointy (VLD shape) with a large meplat, that’s where pointing has the biggest effect; up to 8% or 10%. 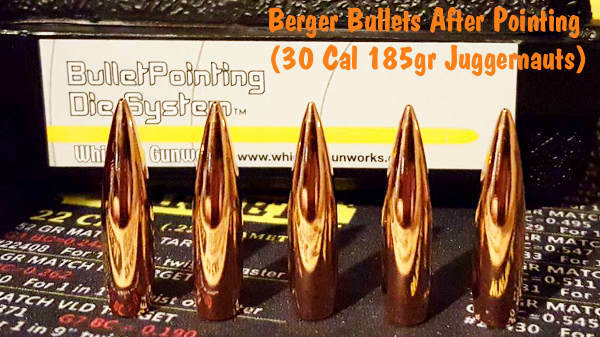 If the meplat is tight on a short tangent nose, the increase can be as small as 1 or 2%.” For example, If you point a Berger .308-caliber 185gr Juggernaut expect to only get a 2% increase in BC. Should You Trim after Pointing? Sometimes you can see tiny imperfections after pointing, but to say you “need” to trim after pointing is to say that the small imperfections make a difference. Bryan Litz advises: “If your goal is to make bullets that fly uniformly at the highest levels, it may not be necessary to trim them.” In fact Bryan states: “I’ve never trimmed a bullet tip, before or after pointing”. So in the end it is up to you to decide. The process of pointing in itself is very simple. It takes about as much effort to point bullets as it does to seat bullets. We are simply making the air gap on the tip of the bullet ever-so smaller. Don’t rush the job — go slow. Use smooth and steady pressure on the press when pointing bullets. You don’t want to trap air in the die and damage the bullet tip. You can use most any press, with a caliber-specific sleeve and correct die insert. The Whidden pointing die has a micrometer top so making adjustments is very easy. 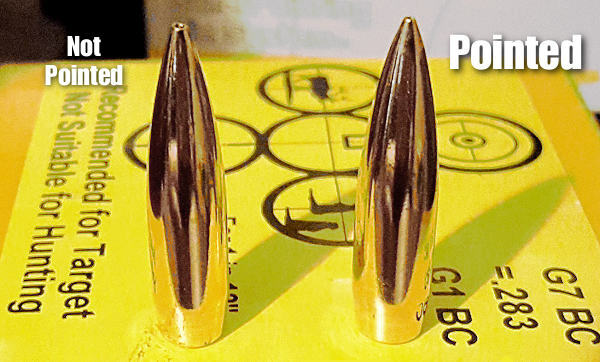 Share the post "Bullet Pointing 101 — How to Point Match Bullet Tips"
During shooting season, there are probably 400 or more club “fun matches” conducted around the country. One of the good things about these club shoots is that you don’t have to spend a fortune on equipment to have fun. But we’ve seen that many club shooters handicap themselves with a few common equipment oversights or lack of attention to detail while reloading. 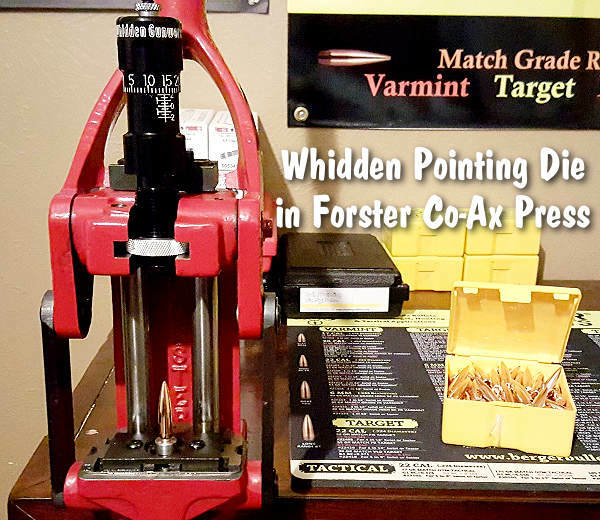 Here are SIX TIPS that can help you avoid these common mistakes, and build more accurate ammo for your club matches. 1. Align Front Rest and Rear Bags. We see many shooters whose rear bag is angled left or right relative to the bore axis. This can happen when you rush your set-up. But even if you set the gun up carefully, the rear bag can twist due to recoil or the way your arm contacts the bag. After every shot, make sure your rear bag is aligned properly (this is especially important for bag squeezers who may actually pull the bag out of alignment as they squeeze). 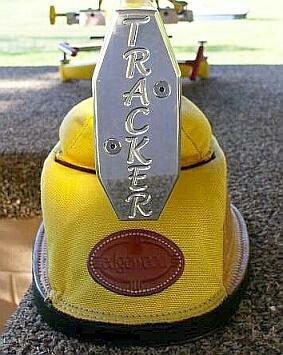 Forum member ArtB adds: “To align my front rest and rear bag with the target, I use an old golf club shaft. I run it from my front rest stop through a line that crosses over my speed screw and into the slot between the two ears. I stand behind that set-up and make sure I see a straight line pointing at the target. I also tape a spot on the golf shaft that indicates how far the back end of the rear bag should be placed from the front rest stop. If you don’t have a golf shaft, use a wood dowel. 2. Avoid Contact Interference. We see three common kinds of contact or mechanical interference that can really hurt accuracy. First, if your stock has front and/or rear sling swivels make sure these do NOT contact the front or rear bags at any point of the gun’s travel. When a sling swivel digs into the front bag that can cause a shot to pop high or low. To avoid this, reposition the rifle so the swivels don’t contact the bags or simply remove the swivels before your match. Second, watch out for the rear of the stock grip area. Make sure this is not resting on the bag as you fire and that it can’t come back to contact the bag during recoil. That lip or edge at the bottom of the grip can cause problems when it contacts the rear bag. Third, watch out for the stud or arm on the front rest that limits forward stock travel. With some rests this is high enough that it can actually contact the barrel. We encountered one shooter recently who was complaining about “vertical flyers” during his match. It turns out his barrel was actually hitting the front stop! With most front rests you can either lower the stop or twist the arm to the left or right so it won’t contact the barrel. 3. Weigh Your Charges — Every One. This may sound obvious, but many folks still rely on a powder measure. Yes we know that most short-range BR shooters throw their charges without weighing, but if you’re going to pre-load for a club match there is no reason NOT to weigh your charges. You may be surprised at how inconsistent your powder measure actually is. One of our testers was recently throwing H4198 charges from a Harrell’s measure for his 30BR. Each charge was then weighed twice with a Denver Instrument lab scale. Our tester found that thrown charges varied by up to 0.7 grains! And that’s with a premium measure. 4. Measure Your Loaded Ammo — After Bullet Seating. Even if you’ve checked your brass and bullets prior to assembling your ammo, we recommend that you weigh your loaded rounds and measure them from base of case to bullet ogive using a comparator. If you find a round that is “way off” in weight or more than .005″ off your intended base to ogive length, set it aside and use that round for a fouler. (Note: if the weight is off by more than 6 or 7 grains you may want to disassemble the round and check your powder charge.) With premium, pre-sorted bullets, we’ve found that we can keep 95% of loaded rounds within a range of .002″, measuring from base (of case) to ogive. Now, with some lots of bullets, you just can’t keep things within .002″, but you should still measure each loaded match round to ensure you don’t have some cases that are way too short or way too long. 5. Check Your Fasteners. Before a match you need to double-check your scope rings or iron sight mounts to ensure everything is tight. Likewise, you should check the tension on the screws/bolts that hold the action in place. 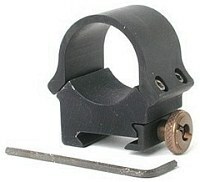 Even on a low-recoiling rimfire rifle, action screws or scope rings can come loose during normal firing. 6. Make a Checklist and Pack the Night Before. Ever drive 50 miles to a match then discover you have the wrong ammo or that you forgot your bolt? Well, mistakes like that happen to the best of us. You can avoid these oversights (and reduce stress at matches) by making a checklist of all the stuff you need. Organize your firearms, range kit, ammo box, and shooting accessories the night before the match. And, like a good Boy Scout, “be prepared”. Bring a jacket and hat if it might be cold. If you have windflags, bring them (even if you’re not sure the rules allow them). Bring spare batteries, and it’s wise to bring a spare rifle and ammo for it. If you have just one gun, a simple mechanical breakdown (such as a broken firing pin) can ruin your whole weekend. Share the post "How to Succeed at Club Matches — Six Tips"